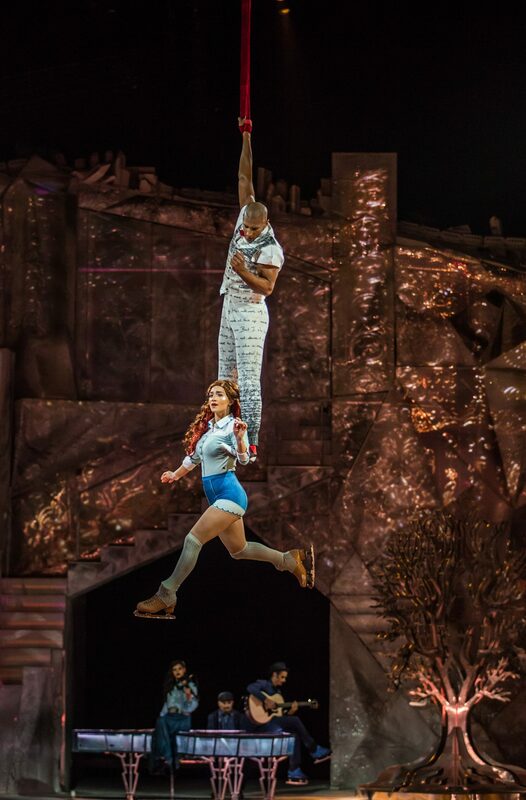 Ice-borne and airborne, Cirque du Soleil’s ‘Crystal’ aims high. Cirque du Soleil is rolling out its first show performed on ice, and Pittsburgh is one of the first cities to see it. Crystal combines ice dancing, extreme skating, and other bladed feats with the company’s world-famous repertoire of acrobatics, high-tech stagecraft, and aerial stunts. If you’ve never seen an ice skater on a flying trapeze, you will now. 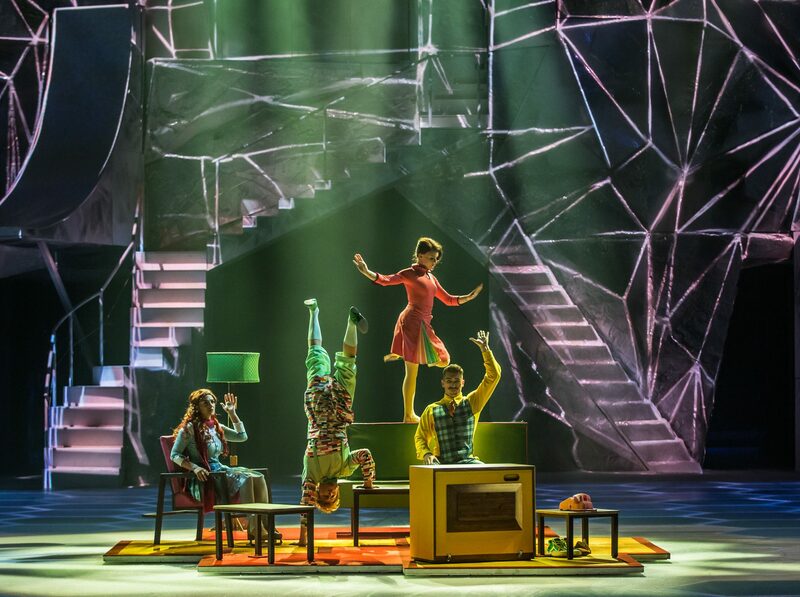 After previews in Quebec, the show premiered over the Christmas holidays in Cirque du Soleil’s home city, Montreal. Then the performers and crew took Crystal to Windsor, Ontario and its cross-river neighbor Detroit. Their venture into the U.S. heartland begins with a January 17-21 run at PPG Paints Arena. Initial reviews have called Crystal “spectacular” and “a thing of beauty.” Not to mention “eye-popping” and “jaw-dropping,” so be sure your facial muscles are limbered up. 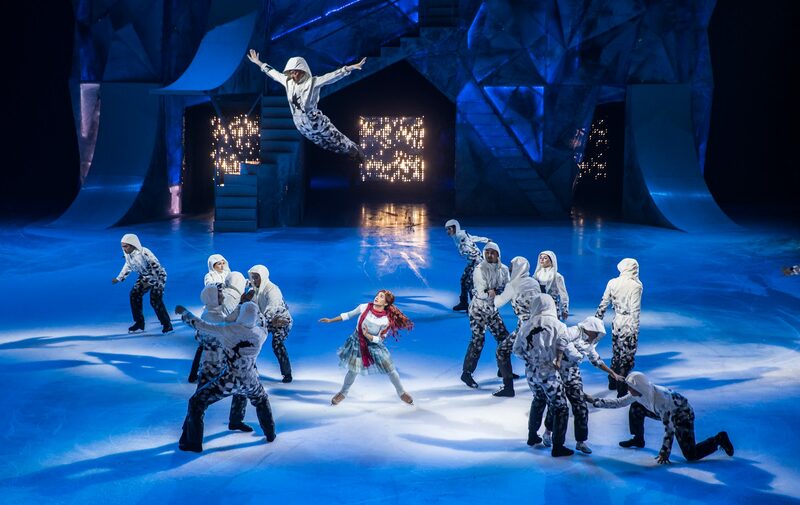 The performers execute leaps, throws, and balancing acts that would be tricky on solid ground, let alone ice. There’s a hockey game featuring moves that defy both NHL rules and the laws of physics. Musical activities include tap dancing on ice—difficult but possible—and, outrageously, breakdancing. Special gloves with little traction spikes are needed for the hand-to-ice parts, but wow, the back spins. Like other Cirque productions, Crystal has a story line. The lead character, Crystal, is a young woman who feels she’s a misfit. She has a “breakthrough” experience—literally breaking through the ice, while skating on a pond (the accident is simulated)—which transports her to a magical world below the surface. Much of the action is then depicted as taking place in this dream world. Through a sequence of fantasy scenes, Crystal imagines seeing and living the routines of everyday life from a bold new perspective. The hockey game becomes a flying, somersaulting human pinball game. Even mundane activities like school and office work explode with amazing possibilities. Crystal learns that even an evening at home in suburbia can have new dimensions. And that narrative provides the pretext for the many boundary-stretching performances that fill the show. At one point, Crystal is skating in her imaginary world and sees her reflection, a shadow self, still skating on the pond ice overhead. The scene is pulled off by suspending another performer upside down from a rig high above. This second Crystal (there are several in the show) glides and swoops through the air in inverted, mirror-image synch with the one who’s skating upright. Very cool. Yet it’s just another day on the job for Cirque du Soleil, which has been in the business of business-as-unusual for more than 30 years. Cirque du Soleil traces its roots to a group of street performers in Montreal during the early 1980s. They played music, juggled, stilt-walked, and fire-breathed—the sorts of things you’d expect from your typical buskers, except they started getting pretty good at it. Two of the performers, Guy Laliberté and Gilles Ste-Croix, drummed up government funding to build something bigger. Their idea wasn’t an overnight success but they kept at it, eventually attracting more grant money and some private investment. Cirque du Soleil was officially founded in 1984. It took a few more years to get the company out of the proverbial woods, in a journey marked by events such as near-bankruptcy and the collapse of the circus tent then used for shows. However, the Cirque that we now know was taking shape step by step. Expert circus artists were recruited to help polish the performances. Engineering and theater-tech crews started designing more complex (and progressively farther-out) sets, props, and costumes. Larger audiences turned up for touring shows in larger venues. Today, Cirque du Soleil is the largest theatrical company in the world. It has over 4,000 employees, including about 1,300 performers plus design and construction teams that would constitute a sizable high-tech firm in themselves. Montreal remains the home base. And Las Vegas has become HQ2, with seven(!) different Cirque shows running in residence there currently. But a question lingers in the minds of some. Is it really a “circus”? Nouveau cirque also tends to be story-driven rather than just a bunch of acts. And it is highly eclectic, mixing techniques and aesthetics that range from state-of-the-art multimedia to commedia dell’arte, the zany 16th-century comedy form that gave us stock characters such as Arlecchino (or Harlequin, if your lingo is not so Italian). Tickets are going fast. The circus is in town. Crystal was created by a multi-person Cirque du Soleil team headed by Yasmine Khalil, Daniel Fortin, and Stefan Miljevic, with directors Shana Carroll and Sébastien Soldevila. Eight performances from Jan. 17-21 at PPG Paints Arena, 1001 Fifth Ave., Uptown. For showtimes and tickets visit the Arena website or call 1-800-745-3000. Mike Vargo, a Pittsburgh-based freelance writer, covers theater and related events for Entertainment Central.